Students love the Small Science activities but initially balk at the workbook – which is essential to consolidating their experience. Right away they don’t put in the same kind of care / meticulousness or deep thinking as they do in the experiment or the oral discussion. We thought perhaps this may be a characteristic of Al Qamar and its Montessori methodology where children are not forced to write. Some of our challenges and successes and our musings on language issues are in ‘Inquiry to learning – 1‘. Our next challenge is to help students systematise their observations. Also we’d like to share teaching strategies and practical suggestions that have worked for us. We’re learning on the job, and hope to learn more from fellow teachers and educators. Although orally students express themselves confidently and effectively, when it comes to writing they don’t seem to have faith in their own experiences / knowledge / observations. They want the teacher to tell them what to write. Finally after I refused (in Grade 3) to tell them, but did provide hints (“did you see anything growing in the water in your hometown? Have you seen the Buckingham Canal or any other river?” etc.) they got enthusiastic and drew on their past observations. Students don’t seem to sustain a long term focus where they have to record something daily for an extended period of time, for example the weather calendar and the moon watch. Only one child — AA took the effort to record it daily. The rest simply gave up after a few days. Another issue is logistics — where students have to observe the sunset / sunrise / moon, etc., they either forget to do the activity at home — or assign blame to the parents for not taking them out / not allowing them on the terrace, etc. In school the third grade students remembered to water their plant, feeling a sense of ownership and responsibility towards it. The 4th graders remembered they had to go to the terrace to observe clouds over a few days. 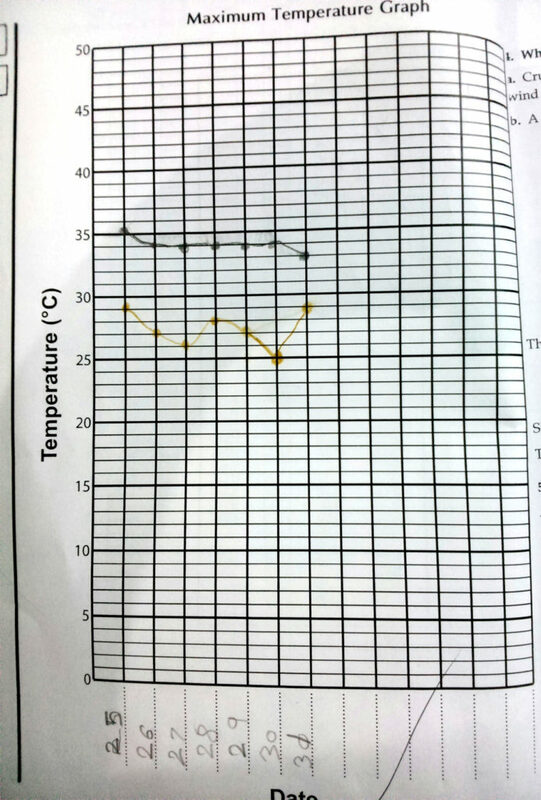 So sustained observations worked in some situations. The 4th grade liked the temperature graph work. Some actually collected cuttings daily and brought them to school. We used that as raw data. As the max temperature was pretty constant each day, we also plotted the min temperature in another colour to see variation. Once they got a little help on how to do it, they managed independently. Students are reluctant to draw in the workbook. Some already feel “I can’t draw well.” Others draw pictures as if it was an art assignment. Even those who love art and can spend time in “free” drawing are not always keen on the workbook drawings. For most of us and in most common situations exactitude in faithfully representing what we see is less important than a “pretty” drawing. When it comes to drawing from observation some developmental psychologists believe that children go through a transition from a schematic stage when they draw “what they know”, to a stage of visual realism, when they start drawing “what they see”. Other psychologists see drawing as a process of largely internally driven problem solving. 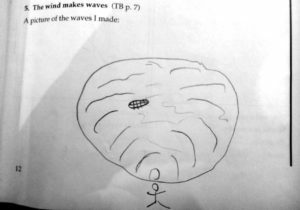 * We try to scaffold this process by pointing out to students that they should draw what they see, including minute details – which way did the waves move in the thali, where were you standing, etc. Drawing to scale is missing at this age although we find that the qualitative idea is well within the students’ reach. A particularly challenging example is the drawing of clouds in the sky. Copying a drawing is much easier for students, but we avoid it in our pedagogy. Quantification begins in Small Science Grade 3 with skills of seriating, estimating numbers and quantities and elementary measurement using informal units. In Grade 4 we use standard units for length, weight (mass) and volume. Tables, charts, graphs and Venn diagrams are introduced through concrete activities. These activities, though acccessible to all students, need step-by-step guidance from the teacher. This year our Grade 4 is also working on the NCERT Math Magic book which has many similar topics related to measurement. We hope that doing these activities side by side will help consolidate the learning. Additionally, we hope students will get past their own learning silos – “this is Maths, this is Science”, etc. and come to use the Small Science workbook in a natural journey from inquiry to understanding. A class period assigned to the workbook worked well. Initially the children were frozen looking at the amount of work — the blank pages are daunting. But with a little help they got to it. Some wrote. Others needed another period – especially in Grade 3. Group work — Clubbing children into groups of similar intellectual ability and having them do parts of the workbook together… Similarly, certain parts can be a full classroom activity — the weather calendar can be photocopied and enlarged and stuck on a wall. Different students can be assigned the responsibility for the recording on different days. Pre discussion — Oral discussion of the questions and potential responses. We found this works for the reflective as well as the analytical questions. The responses should come from the children, not the teacher. These may be recorded on the blackboard for their reference. Additionally, a small discussion can be had on the activity — especially if it was on a prior day to refresh the students’ memories. Sometimes using card material may be a visual stimulant — especially in the life sciences sections. 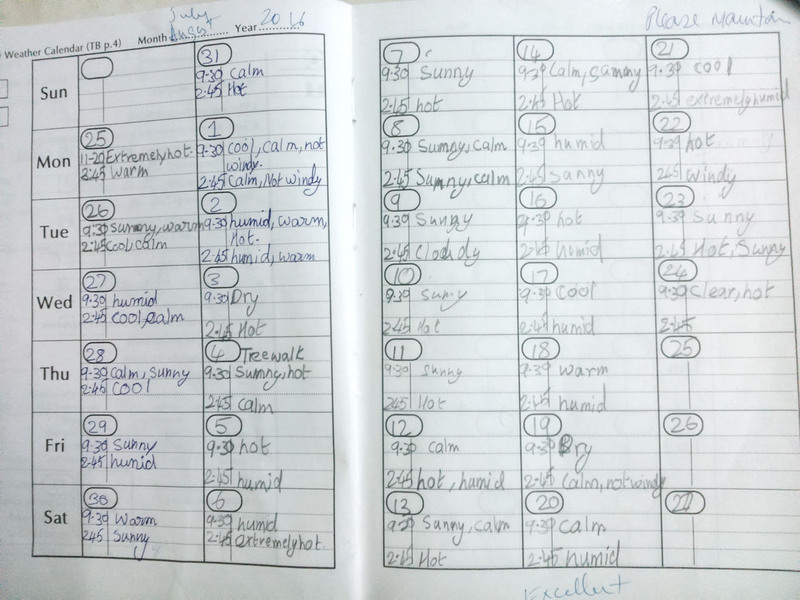 Spelling list — Students can request the teacher to write down difficult spellings on the blackboard. Chunking work — Work related to a particular activity should be done immediately after the activity is completed. This is the “recording” part. Similarly reflective questions related to that activity should be assigned for follow on work immediately. Lowering / modifying standards — Depending on the nature of the class, a teacher may modify her / his standards on work quality — handwriting, spelling, grammar etc, initially to encourage students to come up with responses. Similarly, task completion should not be a goal. Rather individualised standards could be set for different students depending on their skills. Furthermore, submission deadlines should be realistic for students and not dictated by adult schedules. Scaffolding and supporting — One teacher is dedicated to help the students who face difficulties. The teacher and students spend extra time on the workbook. In providing help with comprehension, rather than dictating answers, we try to translate the question into the child’s mother tongue. This does help the child in understanding what s/he is supposed to do. Importance of the workbook to be outlined — The importance of the workbook and its completion should be emphasised repeatedly. A teacher may request students who haven’t done anything on the workbook to skip the class (which all children love) and instead spend the time doing the workbook. I also talk to students about how scientists always record their results, what are log books, etc. Perhaps we could show them pictures of log books of famous scientists, like Madame Curie’s logs. No homework — The workbook should never be sent home for homework as children may get adults / tuition teachers to dictate answers to them — thereby defeating the purpose of the work. Emphasise the importance of making mistakes — Children who may be worried about making mistakes, getting things wrong, should know that learning happens through mistakes. Mistakes are good. Parental involvement for activities — A letter / message can be sent to the parents about upcoming activities and how they can support their child. We regularly whatsapp the mothers with this information and gain their support. Hence moms were waking their children for moon observations, watching the sunrise, etc. Excursions and tours — As many of our children live in small urban homes where their exposure to nature is limited, frequent excursions, workshops and nature walks are really important. These make the questions in the workbook “real”. We went on an excursion to see local trees and to the Croc Bank. The children wrote about the trees and animals they saw. Long term view — As the children progress through the curriculum, there is a noticeable change in their willingness to write and the quality of writing itself. Waiting for this to happen requires patience from the teacher. And finally — reflecting back on the examples of students’ workbook responses, many more questions arise in our minds. We get the impression that all students are capable of rising to a challenge, though they may do it unexpectedly and, to our chagrin, unknown even to themselves. The challenges that we set for them may not always align with those they set for themselves. As teachers we must continue to listen to what our students tell us and tune our own actions and responses with as much sensitivity as we can summon in the flurry of classroom teaching.